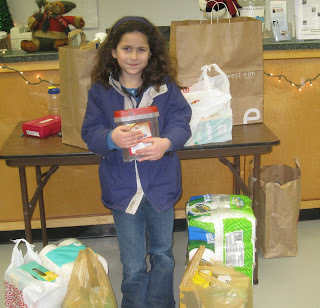 For her 9th birthday, Liora asked her friends to donate items on the Shelter's Wish List, rather than give her presents. She came by with her family to drop off a pile of donations (you can see some of the bags in the background) and for a quick visit with the pets. The cats and dogs at the shelter will be eating well for a while thanks to Liora's generosity!